Live is the second album by AC/DC and the first with singer Brian Johnson. It was recorded in 1990 and 1991 – a long time after the classic If You Want Blood You’ve Got It. After the death of singer Bon Scott, AC/DC recruited ex-Geordie singer Brain Johnson and went on to global popularity with albums like Back In Black and Those About To Rock We Salute You. What a boring title after their first live album. I will be writing a longer review. Here are some videos of AC/DC performing live in concert from around this time. I haven’t seen this album in any of the best live albums ever lists. the earlier AC/DC live album, If You Want Blood does appear regularly. 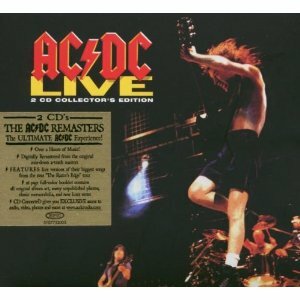 Do you think this is the best live album by AC/DC? Please vote in my readers poll to find out the best AC/DC live album. Does This Deserve To Be Seen As One Of The Best Hard Rock Live Album Ever? I have another readers poll to find out the best hard rock and heavy metal live album ever. If you don’t see your favourite album in that first poll, it might be in the second division. Albums will be promoted if they get enough votes. If you like AC/DC I think you’ll like Black Sabbath, Blue Oyster Cult, Deep Purple, Rush and Thin Lizzy. This entry was posted in 1990s Live Albums, Heavy Metal Live Albums and tagged 1990s hard rock, AC/DC Live Albums, heavy metal 1990, heavy metal 1991 by Paul Simister. Bookmark the permalink.